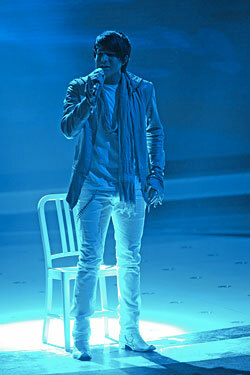 American Idol: So Who Will Come In Second? On Monday, the Post reported that oddsmakers worldwide have already decided that Adam Lambert is the prohibitive favorite to win this season of American Idol. Given that his Gary Jules–inspired version of Tears for Fears’ “Mad World” last night was the only Idol performance in history (that we can remember, anyway) to illicit a standing ovation from Simon Cowell, we’re quite inclined to trust our bookie on this one. (Also, despite a national TiVo malfunction that caused all time-delayed viewers to miss him altogether, DialIdol still had him comfortably in first place last night.) So who will he defeat on this year’s finale? Though our comment section seems to disagree with us, we’ve never found Kris Allen all that charming, and if there’s any justice in this world at all, his “funk” version of Don Henley’s “All She Wants to Do Is Dance” last night will be his swan song. Also terrible? Scott MacIntyre (“The Search Is Over”) and Lil Rounds (“What’s Love Got to Do With It”), who will probably be sent home in random order sometime over the next couple of weeks. Anoop Desai (“True Colors”), Matt Giraud (“Part-time Lover”), and Alison Iraheta ("I Can’t Make You Love Me”) were all okay, though none of them quite managed to make up for crappy performances last week. Once America has dispensed with Scott, Kris, and Lil, we’re pretty sure any of them could be next. We’ve certainly learned our lesson in the past about preemptively declaring can’t-lose winners and counting out their pitchier, less-charismatic competition — but who among the non-Adams of the current season really stands a chance here? For better or worse, Lambert’s performances have been the obvious standouts in every episode, and even his screechiest, most-terrible ones haven’t cost him any votes (he’s never once been in the bottom three). Like Snuggies, Paul Blart: Mall Cop, and current-day U2, he’s an unstoppable phenomenon whose appeal simply defies logical explanation. So, assuming that he’ll be at least be in the finale, who will he square off against?